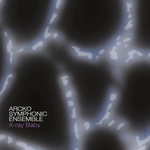 X-ray baby / Arcko Symphonic Ensemble. Particle zoo II : [version for piano with ensemble including double strings] / Kate Neal. Particle zoo II : [version for piano with ensemble including single strings] / Kate Neal. The idea that all matter was composed of tiny, similar pieces was first put forth by Greek philosophers Democritus and Leucippus thousands of years ago, but the idea remained theory until the 20th century. According to Einstein's famous equation, all matter is made of energy, but all matter is also made of fundamental particles. In the 1950s and 1960s scientists developed the equipment necessary to explore the realm of the 'very small' more completely, and discovered a wide variety of particles that were initially dubbed 'The Particle Zoo'. Instrumentation: There are two (2) versions of this work: 1. For double string quartet, harp, solo piano, electric bass, electric guitar, percussion (2 players). 2. String quartet, harp, solo piano, electric bass, electric guitar, percussion (2 players). Commission note: Commissioned by Sonya Lifschitz with funds provided by Arts Victoria, Australia Council. 2 Nov 13: Northcote Town Hall, VIC. Featuring Timothy Phillips, Arcko Symphonic Ensemble, Joy Lee. 17 Jul 2010: at Particle Zoo II (Meat Market (Arts House)). Featuring Arcko Symphonic Ensemble, Sonya Lifschitz.